The 2009 Freedom House Index gave Kazakhstan a score of 6 for Political Rights and a 5 for Civil Liberties, thus qualifying it as a “not free” country, in the company of countries like Russia, China, Cuba, Uzbekistan, Niger and other similar regimes. The Kazakh President is one of the most experienced presidents in the world. He never left office since the independence of his country in 1991, an achievement for which he had to fight hard first with the Constitutional Court in order to extend his term in office until 2000. In an April 1995 referendum he was backed by 95% of the population in this endeavor, a legitimacy for which Western democrats hopelessly crave. Two months later, in August 1995, another referendum allowed him to change the Constitution in order to strengthen the executive. In 1998 the Constitution was again modified, this time by a very compliant Parliament, and extended the presidential term from five to seven years. The opposition’s main candidate was disqualified and Nazarbayev obtained a score of 80% in the presidential elections. In 2004 in the parliamentarian elections only one opposition MP made it through. In 2005 Nazarbayev managed to even improve his electoral support, winning a new mandate with a 91% score. In 2007 the Constitution was again amended and finally removed any term limit set to the reelection of Nazarbayev. The political opposition and the independent journalist did not fare that well during these years however. Some of the main political opponents have been killed, with proven complicity of the security forces, the opposition parties never quite succeeded in passing the 7% threshold or get on TV during electoral campaigns and the allegations of electoral fraud were never investigated during the long rule of Nazarbayev. A long and profitable rule of a former communist ruler who managed to install and develop a sultanistic regime which has nothing to do with democracy and the rule-of-law but has all to do with arbitrary rule, politically driven murders of contenders and personal control over the economy and all the networks of patronage. Engaging Russia in the new European security framework is evidently a desirable objective. 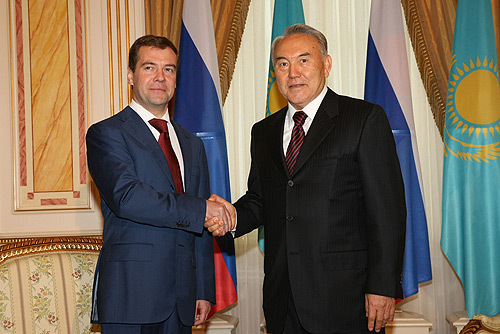 Putting our hopes of reform in the diplomatic ties of Kazakhstan with Russia is somewhat less desirable. On January 12, two days before the inauguration of the new OSCE chairmanship, Freedom House presented its “Freedom in the World 2010: Erosion of Freedom Intensifies”. This very gloomy title marks the fourth consecutive year of democratic backsliding in the world and specifically highlights the authoritarian diffusion of some major powers in their neighboring region or even on the global scale. China, Russia, Venezuela are some of the countries massively contributing to the democratic erosion on the global scale and the map of the Former Soviet Union is particularly depressing, made out of mostly “not free” states and with some others in danger of collapsing in this area, like Armenia and Georgia, the two “partly free” countries of the region. This report explicitly addresses the failure of Kazakhstan in implementing any of the political reforms it promised to endorse in exchange for the 2010 chairmanship of the OSCE. According to the FH definition, “a Not Free country is one where basic political rights are absent, and basic civil liberties are widely and systematically denied.” (see the report, p.3). This report also highlights the fact that the average political rights scores in the former Soviet states, including Kazakhstan, is far worse than the average for the Sub-Saharan Africa and the perspectives seem to remain very much grim in the foreseeable future, due to the authoritarian trends in Russia. Moreover, the main problems in these countries are very similar: electoral fraud, growing number of murders of democrats (politicians, human rights defenders and journalists), lack of horizontal accountability between the branches of power, frail civil society and the implicit or explicit one-party rule. Add to this the growing dependency of politics on the natural resources and the huge patronage networks built on this relation and you have the map of a truly complicated region, all the more so in a context in which a regionally dominant power, Russia, manifests its active interest in the region and seems to export first and foremost authoritarian practices accountable to no one. One generalized authoritarian symptom in this area, as Steven Fish (JoD, Vol. 17, 2006) recently analyzed the phenomenon, is a strong, unchecked executive able to transform the legislative into an irrelevant façade institution. Simply put a strong correlation between high FH Scores (more than 5, indicating not free regimes) and low PPI (Parliamentary Power Index) scores (indicating a weak legislature unable to control the activity of the executive and to keep it accountable as in the western democracies) is the main explanation for the authoritarian rise in the area. In this respect, Russia has provided the most authoritative lesson for neighboring autocrats. Thus, the European faith in the regional cooperation should be at least moderated by the very visible authoritarian diffusion with a similarly regional ambition. For the moment, considering the briefly stated institutional problems of the Kazakh regime, nothing seems to suggest that this country could further the political or the security reform at the regional level. One other possible explanation for engaging Kazakhstan in such an adventure at the OSCE chairmanship could be the European soft power and its strategy of linkage with non-democratic countries in the hope to democratize and consolidate new liberal democracies. If this was the initial hope in 2008 when Western European countries (especially Spain) insisted on this nomination, the failure to bring any kind of change in this country during the last two years is already more than obvious. The Kazakh sultanistic regime is still in place and very much thriving and, these days, even enthusiastic about its projects to bring reforms in the European politics and security. All this said, a wiser attitude than the one formulated by the Finnish Foreign minister would be to sit down and reassess the failure of the European soft power in the ex-soviet region and future prospects for democracy there and less in the strengthening of the OSCE by guys like Nazarbayev and Medvedev. Considering the alternatives, the best hopes for the 2010-2011 OSCE mandate may just be to have a boring and non-eventful year. Firstly, I really liked your article. 1) What exactly do you think the danger is? As in, to what degree do you think Kazakhstan actually has the leverage to cause any damage and what do you expect the damage might be? 3) Were Europe to think of a „harder” policy, would it have the strings to exert some real influence? 1. I don’t think Kazakhstan has a great leverage in the decision-making process, because the OSCE chairmanship is more about creating consensus among the 56 members and less about „big decisions”. However, the two great dangers are an already unfolding one and a potential one. First is the power of the example set by Kazakhstan, who gets this position although tons of reports show that Nazarbayev’s security forces are responsible for killing leading opposition figures and the president rules over a one-party sultanistic regime. Plus the Constitution is a joke, amendable at every 3-5 years. Moreover, I talked about the contagion effect in this area and this total impunity for the crimes of Nazarbayev is definitely bad news for civil society in neighboring countries facing similar dictators. Armenia and Georgia are about to collapse in the not free zone, Tajikistan and the others are in a far worse situation. The other danger is related to the new security framework. The energy sector is a very important one at the moment and this year is lost to say the least. How much leverage Medvedev will get in this context and how persuasive he will in his negotiations with his gas exporting neighbors, this is another urgent issue it’s worth mentioning when dealing with the european security. 3. The strings are definitely looser than in the ECE countries, but the first step would be, like mentioned above, to punish the authoritarian temptations and to encourage/support the NGOs, democratic parties and the journalists. It’s a neccessary learning process of socialization in the norms of democratic rule and human rights protection. It’s a small step, but it’s absolutely necessary to prevent a scenario in which Europe sits at the same table with the murderers of independent journalists in order to bring more democracy and security in the OSCE. there is no chance for reform with Kazakhstan.